The motherboard forms the foundation of every PC build. It determines how much and what kind of hardware you can put into your new computer. From the type of CPU to the amount of RAM, choosing the right motherboard is essential for having the finished product you want. When it comes to Z370 motherboards, they are the highest end motherboards for Intel’s 8th and 9th generation Coffee Lake processors and are the only motherboards that allows them to be overclocked. To help you find the best Z370 motherboard to suit your needs we’ve rounded up our top picks and included a guide below to arm you with the knowledge to make an informed choice. ASUS is one of the largest tech hardware producers in the world and has been around for nearly 30 years. One of their high-end consumer grade product lines is the Republic of Gamers, or ROG. At the very top of this already high end lineup of products are those that hold the Strix banner. 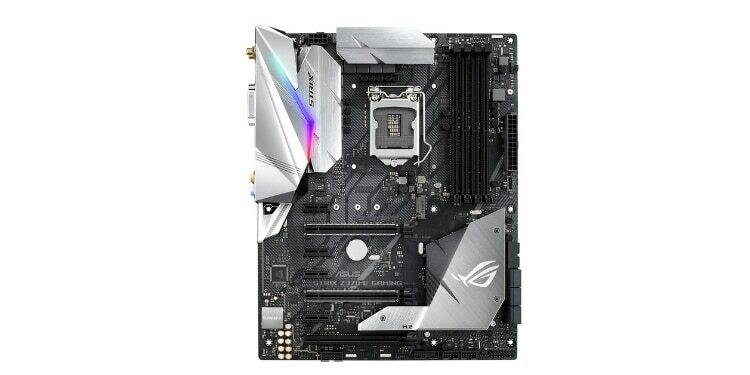 Anything produced by ASUS that brandishes the ROG Strix name is guaranteed to be high quality, and this ASUS Z370 motherboard is no different. This motherboard has all the features you could ask for. For starters is boasts three PCIe x16 expansion slots with easy compatibility for SLI and Crossfire. Additionally, it has two slots for M.2 drives, one of which uses the super fast PCIe lanes while the other uses a SATA connection. In addition to the three 16x PCIe slots, there are four smaller PCIe 4x slots for things like Intel Optane or additional networking cards. That being said, networking cards shouldn’t be needed with this motherboard since pretty much all the networking you could ask for is already built in. On top of normal ethernet, this motherboard has WiFi and Bluetooth built right in. Moving to the back of this board we find that there is some top of the line I/O. There are two connectors for the included WiFi and Bluetooth antennas, various USB ports including USB 3.0 and 3.1 as well as a type-C port. There are three options for plugging in displays, but you’ll most likely be using your GPU outputs with this motherboard. Finally, there are an impressive five audio jacks for 8-channel HD audio. This is also the best Z370 motherboard for overclocking thanks to its 5-way optimization and FanXpert that can automatically tune overclocking profiles tailored to your specific PC for balanced and easy overclocking and cooling. This motherboard will also look good in practically any build thanks to its neutral colors and customizable ASUS Aura Sync RGB lighting. Gigabyte is arguably the biggest competitor to ASUS. They are both about 30 years old, with Gigabyte being just a few years older, and both are massive tech goliaths. 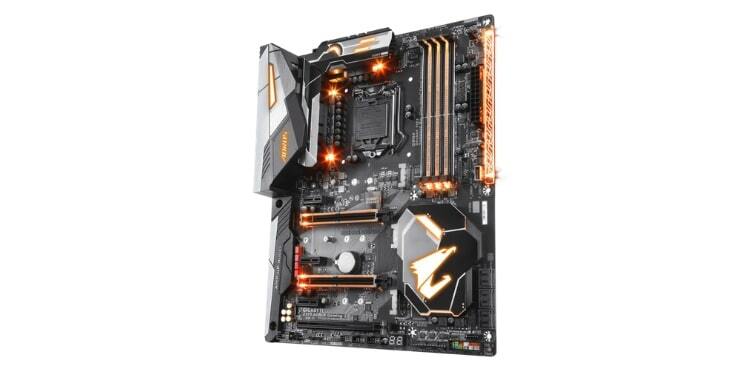 Unlike ASUS, which has a diverse and varied lineup of products, Gigabyte sells almost entirely motherboards-- and more of them-- so it makes sense to look to Gigabyte whenever looking for a motherboard for a new build. Gigabyte offers the best Z370 motherboard for gaming on the market in the Z370 Aorus Gaming 7. 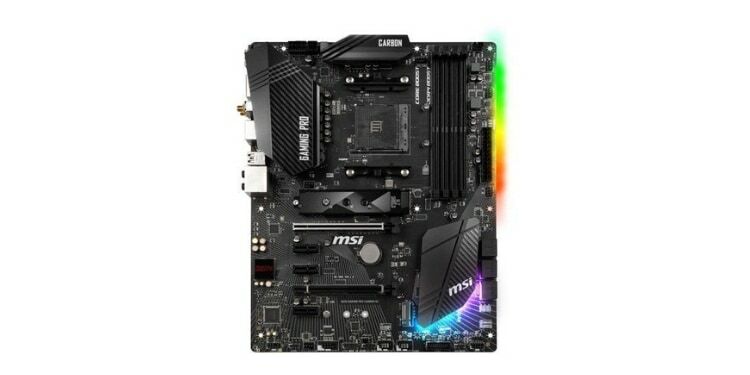 Starting with the most immediately noticeable thing, this motherboard has tons of built-in RGB lighting. There are RGB lights on the RAM slots, VRM heatsinks, I/O shield, PCIe slots, and a few other spots. Each of these zones can be individually controlled through Gigabyte’s RGB fusion software. Aside from the looks, what really makes this motherboard great for gaming are the expansion slots and back I/O. Starting with the expansion slots, we see that it has several PCIe 16x slots that can be used in SLI or Crossfire configurations. While it has one fewer PCIe 1x slot that the ASUS ROG board, it will likely need to make more use of them due to the lack of built-in WiFi. As for rear I/O this motherboard has an impressive five USB 3.1 ports, and even a PS/2 port. No this is not a connector for PlayStation 2 controllers (as great as that would be), but rather an older style of mouse and keyboard connector. PS/2 mice are sometimes preferred by gamers because they often have lower latency than modern mice thanks to the interruptive design of the PS/2 connector. When setting out to build the smallest custom PC possible there is really only one option when it comes to motherboard form factor: mITX. If you want to take advantage of the features offered by an Intel Z370 motherboard then we suggest the MSI Gaming Pro Carbon. This tiny mITX motherboard actually manages to squeeze in an amazing amount of functionality and features despite its diminutive size. Looking at the drawbacks first, naturally being a smaller motherboard means less hardware will fit overall. Unlike the larger ATX boards we’ve looked at so far, this smaller board has only two RAM slots and a single PCIe expansion slot running at 16 lanes. With the negatives out of the way let’s look at what this motherboard does have. For starters, you get WiFi and Bluetooth networking built in so you don’t have to worry about not having and PCIe 1x slots. With the included antennas the signal strength is very good too. 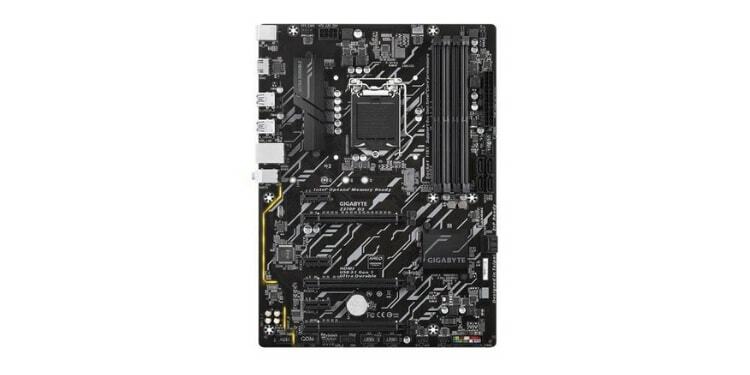 Additionally, this motherboard has tons of I/O built-in including a PS/2 connector, a USB type-C port, and a total of five more USB ports of the type-A variety. This tiny motherboard even has a space for an M.2 drive, making it easily the best Z370 board on the market for pint-sized builds. If you’re looking to build a small form factor PC, but don’t need the absolute smallest motherboard, then mATX is a good option. While mITX is the smallest motherboard form factor, mATX is preferred by many PC builders since it offers a better balance of performance and size for many people. Coming in at about two more inches long on each side, this board offers the full four RAM slots of larger ATX motherboards allowing for up to 64GB of memory to be installed. Also, it sports a pair of PCIe 1x slots in addition to the PCIe 16x slot. That being said, there are a few things that this board actually does worse than its mITX companion. For one thing, it lacks the built-in WiFi and Bluetooth of the MSI board. If you plan to use WiFi or Bluetooth connections rather than just the LAN connection, expect to use one of those PCIe 1x slots. Also, the rear I/O on this board is in some ways worse than the mITX board from MSI. There is no USB type-C port and the Displayport has been replaced with a DVI-D. Overall, the choice here is between more RAM and a couple more expansion slots with the mATX board, or better networking and I/O in a smaller form factor with the MSI board. Finally, we’re taking a look at a motherboard for those who want full-size ATX performance, but don’t want to break the bank. 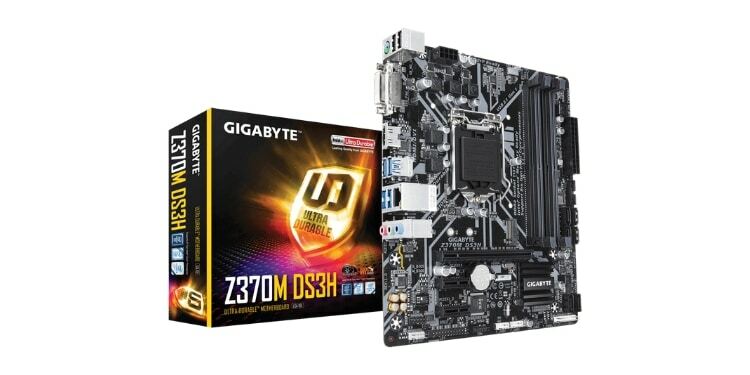 If you’re looking for a solid but budget-friendly Z370 motherboard then look no further than the D3 from Gigabyte. This motherboard is less than a quarter of the cost of the first motherboard we looked at, but still sports many of the key features. Thanks to its full-size ATX form factor it sports three PCIe 16x sized expansion slots, but two of them are stuck running at 4x speeds. There are also three PCIe 1x slots, which you might need considering this motherboard lacks Bluetooth and WiFi networking of its own. The rear I/O featured on the D3 is also pretty impressive for the price with a total of six USB ports, four of which boast 3.1 speeds. Unfortunately, there are no USB type-C ports and video output is restricted to a single HDMI port. That said, this board sports all of the essential features you need to build a capable gaming or work PC at an affordable price. Motherboards are complex pieces of hardware that ultimately determine a number of things about how your final PC will run. In regards to Z370 motherboards, they allow you to use any of Intel’s 8th and 9th generation Coffee Lake CPUs. The Z370 chipset is the highest one offered, and is the only way to overclock “k” sku CPUs. Let’s take a look at some of the most crucial things to keep an eye on when shopping for a new motherboard to ensure you’re picking the best motherboard for your needs. Random access memory, or RAM, functions as the “short term memory” of your computer. It runs at very high speeds compared to slower forms of storage such as hard drives and is used to store data in the short term that the CPU will need quick access to in the near future. What makes RAM unsuitable for long term storage is its small capacity and volatility (meaning whatever was stored on the RAM is gone when the RAM no longer has a constant supply of power being fed to it). RAM takes the form of thin modules that simply plug into the DIMM slots on your motherboard. Different motherboards often have different numbers of these DIMM slots. Almost all of the motherboards on our list have four RAM slots and can accommodate up to 64GB of system memory. The only exception to this is the MSI Gaming Pro Carbon which sacrifices two of these slots and half the RAM capacity for a smaller form factor. Depending on what hardware you plan to put into your computer, expansion slots might be the single most important thing to keep an eye on. Motherboards come with varying numbers and types of PCIe slots on them. These are standardized slots into which a variety of things can be plugged into, including: graphics cards, WiFi cards, and sound cards. There are two main types of PCIe slots, those being 16x and 1x. The larger of these two, 16x, is meant to have more powerful expansion cards like GPUs plugged into them, while 1x slots contain things like WiFi or Bluetooth receivers. It is important to note, however, that some 16x slots don’t actually run at 16x speeds. For example, on the Gigabyte D3 two of the PCIe 16x form factor slots actually only run at 4x speeds, meaning the equipment in them communicates with the CPU much more slowly than a true 16x slot would. In regards to the motherboard, there are two types of storage to look out for: M.2 and SATA. M.2 drives are a more recent technology and take the form of thin PCBs that almost look like a stick of gum. These drives plug right into the motherboard and have direct communication with the CPU making them blazing fast. SATA, on the other hand, is how more traditional storage devices, like hard drives, connect with the motherboard. Memory that uses SATA connectors are much slower, but also usually cheaper. The final thing we’d like to touch on is back I/O. This refers to all of the ports and connections that can be found at the back of the computer when the motherboard is installed in a case. Back I/O determines how many and what kind of devices can be plugged into the back of your PC. One of the things you’ll find on the back I/O are video outputs such as HDMI and Displayport. While this is less important for those who plan to use a graphics card, as in this case you’ll be plugging your monitors into the GPU’s output, you should keep an eye on it if you plan to plug your monitors directly into the onboard graphics. Also, things like USB and PS/2 ports can be found here. Depending on what kinds of devices you plan to plug into your system make sure you have plenty of USB ports available. Those who frequently rely on transferring files to and from flash drives might want to make sure there are plenty of super fast USB 3.1 or 3.0 ports on their system while those who only plan on using a keyboard and mouse may only need a few USB 2.0 ports.